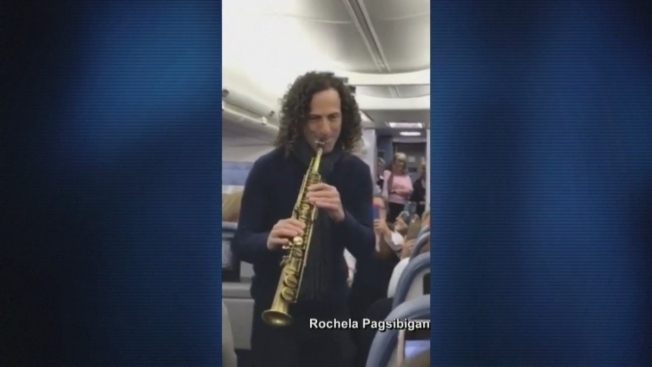 It may not have been on the in-flight entertainment program, but the soothing sounds of Kenny G filled the cabin of a Delta flight Saturday morning. Passengers on board the Los Angeles-bound flight from Tampa were treated to an impromptu live performance by the famed saxophonist. Kenny G was seated next to an off-duty flight attendant who lost a daughter to brain cancer, according to a passenger. The famed musician agreed to perform a spontaneous concert if passengers helped raise $1,000 for a cancer charity. They ended up raising $2,000 for “Relay for Life” and the Grammy-winning artist fulfilled his promise, walking up and down the aisle as surprised passengers enjoyed the mile-high jazz serenade. Kenny G was in Tampa for a performance Friday night at Coachman Park in Clearwater.